First, what is a stepper and what does it do? Steppers are optional for jukeboxes. Their only finction is to allow a wall box to communicate to the jukebox. Plain and simple; that's it. The number of steppers produced does not match jukebox production. Whild most jukeboxes stood alone, some were set up for wall box operation. Steppers are more difficult to find than jukeboxes and finding one that works well is a miracle. It's rare to find a working stepper, as capacitors have shelf life. A NOS stepper may not work. This was a difficult, but fun project. Replacing the caps was the easy part. The discouraging part was discovering that the stepper gears were frozen and would not turn. The problem is that the plastic gear shafts cracked, increasing the circumference of the shat inside the housing. For the time being, NOS gears are available from Victory Glass. There are two gears; one for the numbers and the other for the letters. 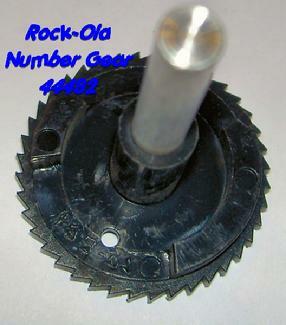 The Rock-Ola part numbers for these are 44481 and 44482. The Victory Glass numbers are 80-4462 and 80-4463. They are $13 each. These NOS gears are black, opposed to the white original gears. White is known to crack, where black doesn't. Make no mistake, replacing the gears is no simple task. Disregarding all the hardware that has to be removed, gear alignment and proper spring tension is paramount. Determining the proper spring tension is trial and error. It resembles winding the spring on a window shade. If it won't roll all the way up, take it down and tighten a little more. That's how this works. Frustrating because complete reassembly is required to test the unit. There is lots of satisfaction when you finally get it working. I was successful on my first stepper. Although the 1754 stepper will work with the 1493 Princess, the acutal stepper is 1745. The two units perform exactly the same, with a few minor differences in the layout. Mounting of the unit is slightly different, but the cables in the 1745 more suited for the 1493. 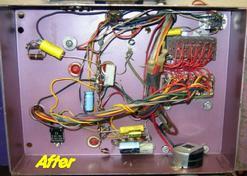 Replacing the original capacitors is a must. If the pictures below don't convince you, then keep in mind that the old caps are approximately 50 years old. Caps die due to age. With limited soldering skills, replacing the caps is easy. Don't buy NOS caps on Ebay. Shelf life is a factor. New, reasonably priced and fresh, caps can be obtained from Vern Tisdale. See his site on our friendly links page. Don't be in a hurry. Do a neat job. 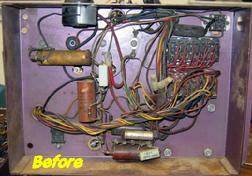 Many of these steppers have not had the best of care and will need lots of cleaning and touch up. 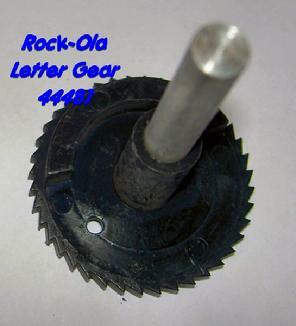 Here is a PDF of the Rock-Ola 1745/1754 stepper. It is my hope that this scan is adequate for your reference. 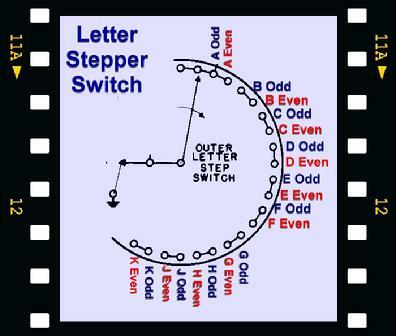 The stepper has one step switch board for the number selections and two step switch boards for the letter selections. 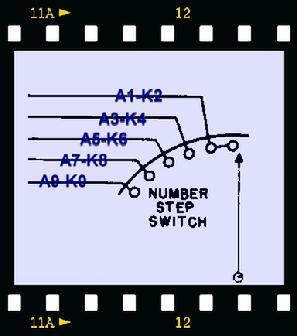 As seen in the schematics below, the number board has six contacts. The first two contacts are shunted, making the first contact, a dummy. The second contact is for #'s 1&2; Third contact for #'s 3&4; Fourth contact for #'s 5&6; Fifth contact for #'s 7&8; and the Sixth and final contact are for #'s 9&0. The letter step switch board has 22 contacts. The first 4 are shunted. The first 2 of the 4 are dummies. This leaves 10 pairs of contacts; one pair for each letter A-K. Each pair is shunted. For incorrect selections made from your wall box, this drawing may help in determining the malfunction.